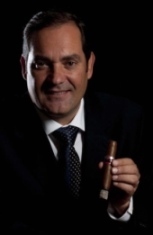 3) Inside the Industry: Gran Habano announced the new limited edition Gran Reserva No. 3, which uses extremely old Nicaraguan and Colombian filler tobaccos. The Cuban Ramón Allones brand is expanding to include a new Corona Gorda that will only be available at official La Casa del Habano stores. 4) Around the Blogs: Stogie Review reviews the Illusione 888 Slam. Smoking Stogie smokes a well-aged Liga Privada No. 9. Cigar Fan lights up two Saint Luis Rey Maduros. Nice Tight Ash checks out the Toraño Single Region. Cigar Inspector inspects a Ramón Allones Superiores. 5) Deal of the Week: This Rocky Torpedo Sampler features 14 torpedos for just $50 (that’s about $3.50 a stick). Included are two each of the Decade, Vintage 1992, Vintage 1990, Edge Maduro, Edge Corojo, Connecticut, and Sun Grown blends. Glad to hear the Guillermo Leon line will finally be available everywhere. I had my first back in early September and loved it, then was able to pick up a 5-pack from a retailer who got some early…still fantastic. It's definitely in the running (in my mind) for "best new smoke from the 2010 IPCPR show."